Stephen King’s Doctor Sleep is up one position, ending the week at number 1. For more info about this title: Canada, USA, Europe. 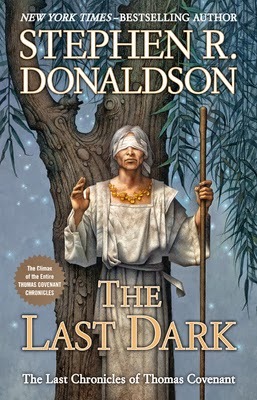 Stephen R. Donaldson's The Last Dark debuts at number 15. For more info about this title: Canada, USA, Europe. George R. R. Martin's A Game of Thrones maintains its position at number 10. Orson Scott Card's Ender's Game is up six spots, finishing the week at number 13 (trade paperback). George R. R. Martin's A Feast for Crows is up two spots, finishing the week at number 14. George R. R. Martin's A Storm of Swords is up three spots, finishing the week at number 15. George R. R. Martin's A Clash of Kings is up two positions, ending the week at number 18. Stephen King's Joyland is up two positions, ending the week at number 21 (trade paperback).